Optoma's new flagship ThemeScene projector | What Hi-Fi? 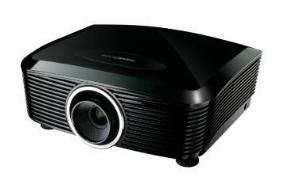 The new model, which starts from £2799, has improved brightness and contrast, and also incorporates a new version of the company's Puremotion picture-processing engine, claimed to eliminate judder while optimising the projector for 1080p 24fps content. Brightness has been increase to 1700 ANSI Lumens, and the ANSI Contrast ratio is 800:1, while dynamic contrast is 80,000:1. Optoma says the ANSI contrast figure gives a much more accurate measure of real-world performance, being measured when the screen is showing both black and white elements, rather than the full-screen white/full-screen black measurement method. The Puremotion 3 processing eliminates judder and motion-blurring for smooth movement, and the projector also features an improved Colour Management System and Dynamic Black, along with a user-adjustable nine-step iris and vertical and horizontal lens-shift. The HD87 has three HDMI inputs, plus component, RGB/VGA, composite and S-video inputs, plus two 12V trigger sockets and an RS232 connection. It's available now with three lens options, costing £2799 with standard lens, £2999 in a long-throw version, and £3399 with a short-throw lens.